What challenges are you facing? I need more, better leads, right now! Drinking our own champagne. Six pains we probe for and five objections to overcome. If satisfaction is the goal, what’s the KPI? It’s the day of the big show. The team is briefed, the demo is loaded, and the display stand is full of shiny brochures. But how confident are you that all that work will produce a real return? Or are you doing it because you did it last year? 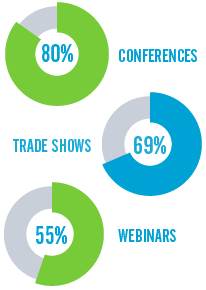 Whether we’re talking webinars or major trade shows, we understand how events fit with the rest of the demand gen machine – and how they produce real ROI. What are you up against? Struggling with the event silo? Events teams often work in a vacuum – yet they are an essential and highly effective part of your demand gen and nurturing programs. Let us help you join the dots and reap the benefits. What did you learn from last year? To do the same again and hope for the best? Or to refine and improve based on hard data? We test, analyse and compare – and apply our own experience – to help you make each event better than the last. Now, what about recruiting the audience? Avoid empty chairs (or webinar rooms) by targeting the segments in your database most likely to attend and using the right blend of tele and digital to maximize registration – and minimize drop-out. Automate where possible (with a frictionless registration experience) but remember that pitching an event to a senior-level audience requires a very personal touch. Is it a relationship – or a series of first dates? Tracking event attendance history is tricky – but essential. Avoid corporate amnesia and talk to previous attendees in the way they would expect. Move the relationship forward instead of starting over every time. You had them – and you lost them. The audience loved your content, but how do you extend their engagement beyond the event itself? We can prevent warm leads from going cold by making the follow-up timely, relevant and compelling. The leads coming from events are not the only measure of value. Insight gathered through conversations or online polls is useful in honing your ongoing nurturing efforts – provided systems talk to one another. Let us help integrate your event platforms and extract that extra value. Don’t wait until you bump into us at the next conference or summit. Get in touch now.